Tebow can play hardball, too! Call me surprised … in a most pleasant way. Tim Tebow, the one-time standout college football quarterback who didn’t cut it as a pro, has turned to baseball. I once thought the Heisman Trophy winner’s stint with the New York Mets organization was little more than a publicity stunt. You may dip me in sesame seeds. It turns out Tebow is starting to get the hang of the game he didn’t play seriously since high school. 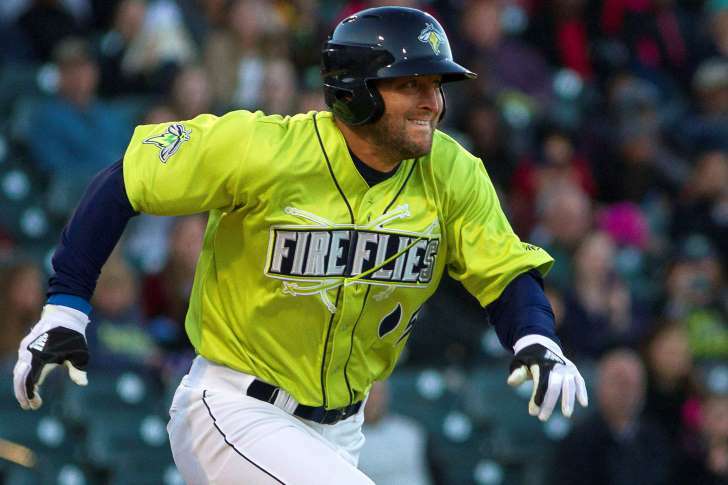 Tebow is learning how to hit pro baseball pitching while playing for the Columbia (S.C.) Fireflies. He started out abysmally, but has gone 9 for 20 of late, raising his batting average to a respectable .246. Tebow’s status as a bit of a cult figure goes a good bit beyond his athletic prowess. He is known as an devout Christian who introduced a new verb to the English language: Tebowing. It’s meant to describe the kneeling pose Tebow would use whenever he scored a touchdown. Tebow would kneel while saying a brief prayer of thanks to God. Yes, I was skeptical about his baseball adventure. I feared the Mets had denied another more deserving young man a shot at making it in the big leagues by giving a high-profile celebrity-athlete a chance to play some hardball. Tebow gave up football after being unable to make the grade with a number of National Football League teams. He fell victim to the curse that occasionally hits Heisman Trophy-winning athletes, those who are unable to lift their game to a competitive level in the pros even after excelling at the college level. Baseball, though, is providing him with another opportunity. I wish the young man well and hope he continues to improve. I am fascinated by what I perceive to be a stunt being performed by one Tim Tebow, the former Heisman Trophy-winning college quarterback who couldn’t cut it in the National Football League. He’s now trying to become a professional baseball player. He wants to play professionally a sport in which he hasn’t participated in since, oh, high school. I keep wondering about a certain aspect of this fellow’s change of career plans: Does his celebrity status make him more marketable than his actual talent? And does that status as a media star prevent another, more deserving young athlete from obtaining a spot on a baseball team roster? Do not misunderstand me. Tim Tebow appears to be a fine young man. He made news when he started kneeling after scoring touchdowns; he would say brief prayers of thanks to God, which endeared him to many God-fearing football fans. I like that part of the young man’s character. Then that persona took over. It made bigger than life in some people’s eyes. It followed him everywhere. NFL teams were criticized by some fans for cutting him from their roster because the fans perceived a bias against his devout religious faith. Baloney! The guy’s pro football skills at quarterback don’t measure up. He’s a heck of an athlete. Tebow is a tremendous physical specimen. He’s built like a linebacker and he might have become a good defensive player, or perhaps a tight end. Now we hear that at least two Major League Baseball teams are interested in this guy: the Atlanta Braves and the Colorado Rockies. It’s fair to ask: Is their interest based on what they see on the baseball field or is it based on how he might boost attendance at baseball games, given his celebrity status? Remember when basketball legend Michael Jordan tried his hand at pro baseball? I remain convinced to this day that he was awarded a minor-league spot on the basis of his acclaim as a basketball player, denying someone else a spot who likely deserved it more. Thus, are we talking about furthering another young man’s baseball career or allowing him to perform a publicity stunt? Tim Tebow won the Heisman Trophy while playing quarterback at the University of Florida. His pro football career has been something, well, less than stellar. Still, he remains an icon for his off-the-field endeavors, mainly due to his faith and, get this, because he was home-schooled during his high school years. Tebow was allowed to take part in extracurricular activities in his hometown of Jacksonville, Fla., even though he didn’t attend school in the traditional sense. Some Texas lawmakers want the University Interscholastic League to lift its ban on home-school students taking part in extracurricular activities. Don’t to it, UIL and the Texas Legislature. Parents are certainly entitled to educate their children the way they see fit. If they don’t want to enroll their kids in public or private school, they can teach them at home. Millions of students are taught at home as it is. The idea, though, of allowing home-schooled children to take part in activities in actual schools shouldn’t sit well with the parents of children who are actual students in those schools. The Texas Home School Coalition Association notes that parents who home-school their children pay property taxes that funds school activities and, thus, are entitled to have their children partake in them. Is it fair, though, to allow parents to cherry-pick how they reap the benefits of the taxes they pay? They don’t want their children educated by public school teachers, but insist that they be allowed to play football (as young Tim Tebow’s parents were allowed to do), march in the band, or perform in dramatic productions? No. Those parents have made their choice on behalf of their children.